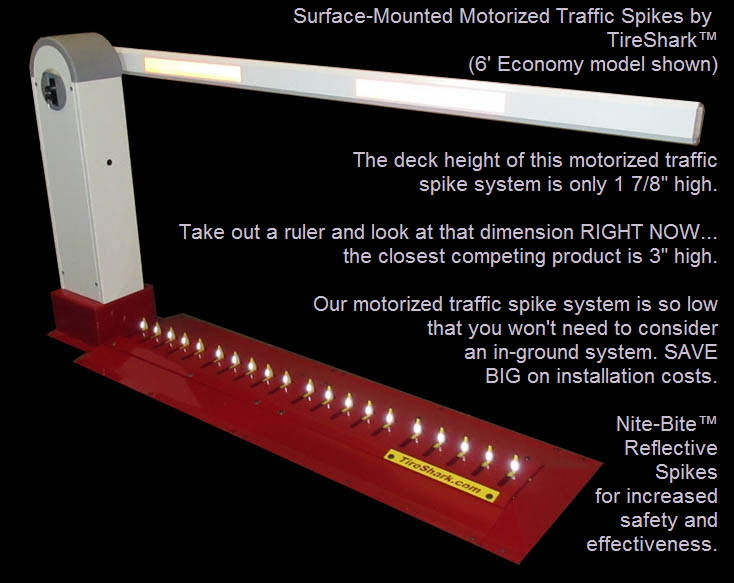 One Way Traffic Spikes and Motorized, for Parking Lots and Garages. PLEASE INCLUDE your shipping address with phone number. Always use proper warning signage. The threat of tire damage can make Tiger Teeth and Road Blockers effective tools for parking lot security. Severe Tire Damage can occur over traffic treadles in parking lots and garages. Tire strips, treadles, tire killers, Alligator teeth, and rippers. Shredders, motorized traffic spikes (bi directional), spike systems can offer great security control. Mechanical tire poppers, Sabre tooth teeth, and access controls, like bollards, typically are non-motorized, using no hydraulics. Improve your security with Tiger teeth, tire shredders, wrong way tire systems TireShark traffic spikes. 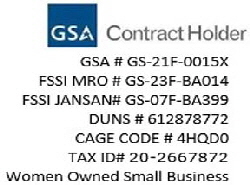 Cobra and Enforcer are generic brand spike systems. Our products are used to control driveways and lanes. WORLD'S STRONGEST ONE WAY TRAFFIC SPIKES AT 1/2" THICK STEEL. Motorized systems by TireShark have the lowest deck height in the world, reducing vehicle contact and increased maintenance. 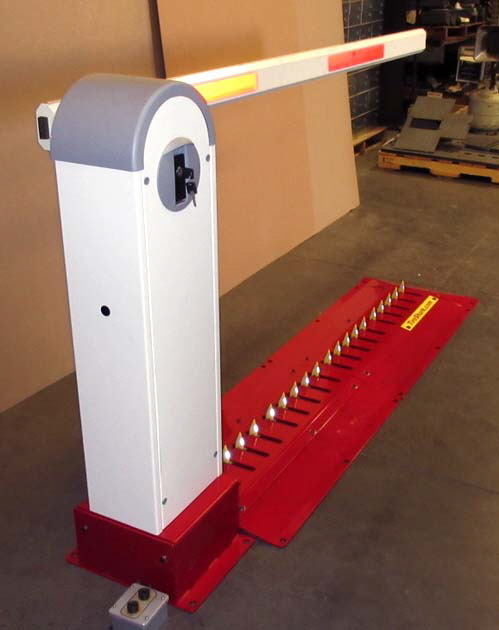 Drive across the system without an uncomfortable amount of vehicle lift or bump felt when entering or exiting your facility. Manufactured using same computerized laser cutting and forming machines, eliminating the headaches caused by hand welding of deck and support structures inside. THESE ARE THE HIGHEST QUALITY. We manufacture our own in-house brand of Motorized systems to complement the installation of single direction systems. Our electronic controlled systems are the best on the market with the lowest deck heights for the most comfortable drive across. Designed to allow sports cars to be able to cross safely. Our super-low deck heights are the lowest in the world. So low, that you don’t need to consider in ground motorized traffic spike systems. Surface mounted traffic spike systems are MUCH more affordable to install and are FAR easier to maintain, resisting build up of mud, unlike in ground systems that rest below grade level. A brief video of our Motorized Traffic Spikes being tested prior to shipment. a parking lot uses one way traffic spikes to control traffic flow. Drive across the one way traffic spikes to enter the parking garage. They are used to create traffic that travels in a single, or one, direction. One way lanes facilitate only one way traffic, directing vehicles to traverse in a single direction. One way traffic spikes typically result in greater traffic volumes as drivers are able to avoid oncoming traffic or crossing and merging into oncoming traffic. Narrow lane negates the safety of movement in dual directions. Design of paid parking or controlled vehicle access. Security safety for personnel and property. Vehicles traveling the wrong direction on one way freeways has been a traffic safety issue since the interstate highway system was created prior to the 1960s. The vast majority of wrong-way drivers turn around and drive back into the correct direction. Some drivers, even though they are not intoxicated, do continue to drive the wrong way on a one way thoroughfare. Many civilians think that spikes can be a cure to preventing wrong way travel, but these systems are not designed for repeated, high speed impacts. We can develop a system that can work, but it would require about $10 million in research and development to design a computerized system. Such one way traffic spike systems would be very expensive to install at each traffic access point, costing approximately $2 million per use/area. Approximately 360 people are killed annually in wrong way highway crashes, with thousands more being injured. Some states take additional actions to improve entry and exit designs, signage, and striping to prevent wrong way accidents. Some states are researching intelligent transportation system technology to track directional violations. Other systems use embedded sensors, flashing lights, and recording equipment to see how a driver became involved in traveling the wrong way in a one way traffic environment. Our one way traffic spikes have the lowest deck height in the industry! Only 1 3/4” high, it is easy to cross over with sports cars in comfort. 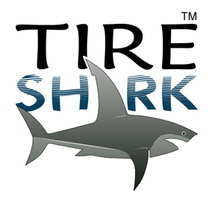 TireShark One Way Traffic Spikes are very low. You don’t need to consider the use of in ground, flush, traffic spike systems. In ground systems are more difficult to install. Our one way traffic spikes install super easily onto concrete or asphalt road surfaces. For installation of one way traffic spikes onto asphalt, use construction epoxy. Use epoxy OR anchor bolts that are secured into drilled holes for one way traffic spikes that are installed onto concrete. Accordingly, the installation of our one way traffic spikes is very easy. Most handyman services can handle the installation. Normally contractors are called to perform the installation of one way traffic spike systems. Minimal obstructions help to guide traffic flow into one way travel in parking lots, garages and secures the lane. One Way traffic spikes, made by GR8 Holdings LLC are the best that you can buy. Our one way traffic spike bearings are easily replaced, unlike the competition’s, which cannot be replace (that makes NO sense!) Our one way traffic spikes’ decks are non-welded, meaning that they are not brittle and can take serious hits.. If you’re going to want longevity and performance, make sure to install our one way traffic spikes. Our latch-down system is super easy to use. It allows for passage in both directions for moving days or special needs. OneWayTrafficSpikes.com’s one way traffic spikes use no electrical connections. *25 year warranty applies to TireShark brand steel spike sections only and covers manufacturing defects as determined by the manufacturer; use/wear/abuse is not covered. Webmaster: GR8MFG@HushMail.com All material copyright 2017 by GR8 Holdings LLC.